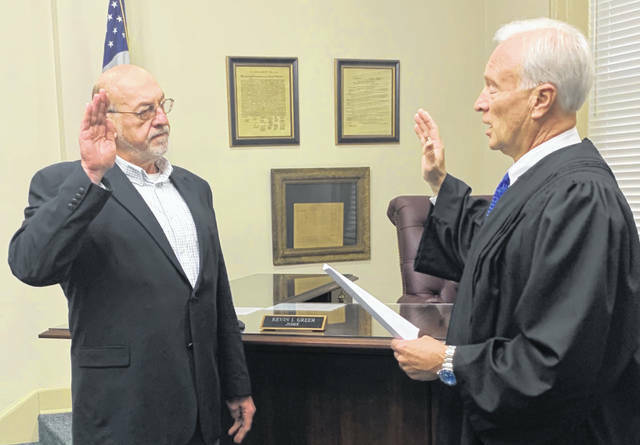 Tom Eichinger, left, is sworn in Wednesday morning as president of Hillsboro City Council by Judge Kevin Greer, right. Members of the Highland County Republican Central Committee on Tuesday nominated Eichinger to replace former Council President Lee Koogler, who resigned in March. Eichinger, a local Republican, is resigning as chairman of the Hillsboro Planning Commission to take the seat, and he will campaign to keep it in the November General Election, officials said.